Aliens: Dead Orbit #2 Review – AiPT! Issue one of James Stokoe’s four part series Aliens: Dead Orbit may just be one of my favorite single-issue comics of this year. To say the least, waiting for issue number two has been difficult. My cravings for terrifying space monsters has finally be sated, for the time being anyway. So let’s dive in and find out if issue two is any good. Last issue we were introduced to chain smoking engineering officer Wascylewski. Stranded and alone in the dark reaches of space aboard the decrepit and failing fuel depot Sphacteria, Wascylewski fights for survival against the deadliest and most terrifying creature imaginable, the Xenomorph. While we weren’t given any of the dirty details surrounding the circumstances of each crew member’s demise, it isn’t too hard to imagine how we ended up with our lone survivor. As with the first issue Stokoe continues to tell two stories surrounding one character at the same time, one in the past and one in the present. We start with the latter and pick up right where things left off–Wasclyewski running for his life with the awesomely terrifying Xenomorph in tow. After narrowly escaping the Xenomorph the lone engineer hides in the ship’s medical bay, where he faces a very dead, mutilated and leaky body poking out from beneath a sheet. Perhaps even more worrisome is Wasclyewski’s watch, which is counting down to something technologically ominous that requires his immediate attention and the noticeably absent case. Seeing the dead body hits the rewind button as we’re taken back into Wasclyewski’s horrifying memories to relive the experiences that led to this current moment. After which we fast forward back to present time to face the dilemma of the missing and crucially important case. It’s hard to call how the Xenomorph arrived on the Sphacteria predictable, especially since Stokoe makes no real effort to hide it from the reader. So while I take zero issue with how the story is constructed in this regard, I will say I was hoping for just a tiny little bit more mystery there. Unsurprisingly, the artwork of James Stokoe continues to delight, entertain and amaze. What really stuck out to me in part one was the incredible attention to detail; each and every panel demanding you comb through it with a fine tooth comb, out of fear of missing some important clue. While the detail is still present, it’s not commanding the pages as it did the first time around. But that’s okay because instead of detail, atmosphere takes center stage and that’s exactly what’s needed to keep this story at the high bar Stokoe has set for himself. The atmosphere slowly settles in and menacingly builds with tension and terror until it’s downright uncomfortable. As Wasclyweski despondently takes in a dead body and doomsday count down, you’ll feel the blanket of cold dark isolation and hopelessness he’s wrapped in. You’ll feel the heart pounding adrenaline as he runs for his life to escape the most terrifying nightmare space can produce. You’ll catch yourself holding your breath as the ship falls apart around him and he fights against suffocation and the vacuum of space. This is all possibly because of the distinctly wonderful style that Stokoe has become known for. We know the story being told here is one of survival, isolation and horror. We know Wasclyweski is alone and all his crew mates are dead. We know he’s being hunted and possibly even toyed with. We know he doesn’t have any weapons. We know he doesn’t stand a chance. Yet despite knowing all these things about a story that you could easily call predictable, we’re still happy to strap ourselves in and watch this poor guy’s own personal hell play out in front of us. 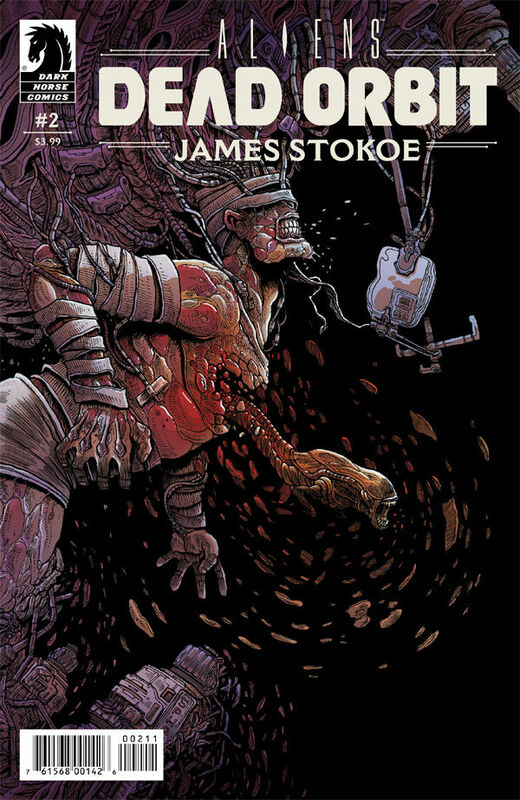 That’s because James Stokoe has tapped into the core of what makes Alien so special–heart-pounding claustrophobia, teeth grinding tension and a space creature that has terrified fans for nearly 40 years. James Stokoe has tapped into the core of what makes Alien so special--heart-pounding claustrophobia, teeth grinding tension and a space creature that has terrified fans for nearly 40 years.